For all that BioWare have told us about the people and gameplay of Mass Effect: Andromeda, we still find ourselves wondering what actually… happens. In the original trilogy, the Reapers were established as the coming galactic apocalypse from the first mission of the first game, and the overarching conflict of the series was how to discover, forestall and then survive their eventual attack. If you’ve followed Andromeda at all, you know there’s none of that this time around. You know you’re off to explore a new galaxy, but what exactly are your goals when you set out, and what challenges will you face when you arrive? Read on for everything we know so far about the premise, major plot points and antagonists in Mass Effect: Andromeda, including a fan theory that the Andromeda Initiative are much more than they seem. And if you’d like to know who’s by your side throughout all of this, check out our Mass Effect: Andromeda character guide. 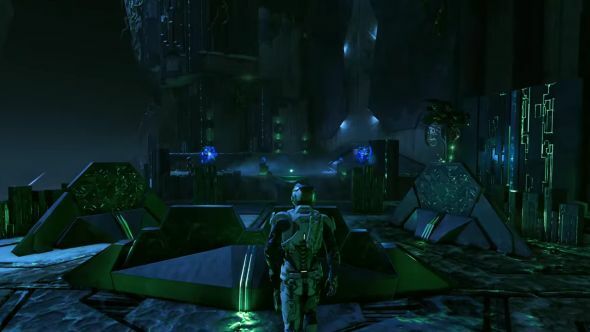 Mass Effect: Andromeda concerns an expedition to explore and colonise the Andromeda galaxy – specifically, its Heleus cluster. The Andromeda Initiative are the “civilian, multi-species project” organising the trip, and until quite recently, we knew very little about their backers or motives. But at a presentation ahead of our hands-on preview, we heard that “a group of very powerful people” are behind the Initiative, and that having observed “there were a lot of threats around the Milky Way in general”, they conceived the Initiative as a “plan B”. Apparently this was an idea “they had thought about for a longer time”, but something prompted them “to accelerate the process”. We’ll have to play the full game to learn who these people are, or which threats exactly they were responding to. We know the Andromeda Initiative was founded in 2176, which according to the Mass Effect wiki’s handy timeline, coincides with the Skyllian Blitz. This was the biggest of many attacks on human colonies by Batarian-funded pirates, and could have catalysed the Initiative. The decision to “accelerate the process” could have been prompted by any number of later threats, such as the Geth, the Collectors and of course, the Reapers, if the Initiative’s leaders were among the few to take Shepard’s warnings about them seriously. Physically, the expedition comprises the Nexus – a small space station – and four arks, each housing a different Milky Way species. The human ark is named Hyperion. Each ark has a Pathfinder, an experienced soldier, scientist and explorer who leads a small team in scouting suitable planets to settle. Pathfinders are the tip of the spear in the Initiative’s colonial ambitions, and you will take the role of one of the twin children of Alec Ryder, the human Pathfinder. Your dad has been retconned into Mass Effect lore and casts a pretty big shadow. Not only is he an N7 marine – the designation reserved for Earth’s very best soldiers – but he was also one of the first ever humans to enter a mass relay under the leadership of Alliance hero Jon Grissom. Alec fought the Turians during the First Contact War, after humanity got a little too keen on exploring mass relays, and has done pioneering research into artificial intelligence, having built the AI that serves the human Pathfinder team, SAM. We know that Mass Effect: Andromeda will not feature an overarching ‘big bad’ like the Reapers from the original trilogy, which will enable BioWare to strike a lighter tone. Although, when you consider that previous games have seen its villains cull millions upon millions of people, ravage most of the galaxy’s developed planets, or literally liquify your crew, a lighter tone in Andromeda still leaves plenty of room for darkness. The main antagonists are an alien race called the Kett. They’re one of three indigenous species we know of so far (well, sapient ones, at least), and are the most outwardly hostile. In a flip of the traditional sci-fi script,weare the invaders in their eyes. Perhaps they think they’re simply defending themselves, though if so there’s a touch of hypocrisy there; producer Fabrice Condominas told us that “the heart of the Kett civilisation isn’t in the [Heleus] cluster”, so they are themselves a travelling race. What might bring them to the galactic frontier? In ourpreviewof the game, we explored a Remnant ruin (more on them in a sec), where we found Kett technology and corpses. It’s fairly clear, then, that the Kett have an interest in this race of ancient machines. So in contrast to the godlike and inscrutable Reapers, the Kett are organic villains, with motives we can understand. Their leader is titled the ‘Archon’ – that’s a Greek word meaning ‘ruler’, which has been used to refer various political or judicial offices in the ancient world, and to divine servants (like angels) in the Gnostic religion. 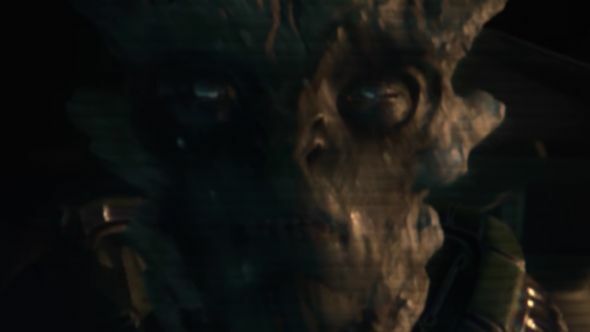 We got our best look at the Kett Archon in the New Earth trailer, where he attacks the human ark Hyperion as it approaches a world they’re hoping to colonise. Later in the trailer, Scott Ryder says “we’ve been outplayed. The Archon is a master of his game,” as the Archon unleashes a blast of blue energy. In his first appearance in the N7 Day trailer, his final words are “now I know what makes you special.” It seems the Archon is more than just a brute who wants to kill you; he has plenty of analytical and strategic nous. Not all of Andromeda’s challenges will be violent. Leaning in to Mass Effect’s traditional strengths in interactive dialogue, the Pathfinder will need to be a diplomat as well as a soldier; producer Mike Gamble saysthere’s a “political game” going on in Andromeda, that “not everyone arrives” in the galaxy at the same time, and that some elements of the Andromeda Initiative “broke off and formed factions”. Perhaps Hyperion arrives late in Andromeda, and by the time we stumble onto the galactic stage, the occupants of the Nexus and the other three arks have had months or even years to claim the plum roles? There are hints of this in the TGA trailer, where Sara Ryder encounters Sloane Kelly, the former head of security on the Nexus. We got to play through that mission in our preview, and it’s clear that in whatever time has passed since Kelly split from the Initiative, she has installed herself as head of a group of exiles, with Turians and Krogan in her employ. 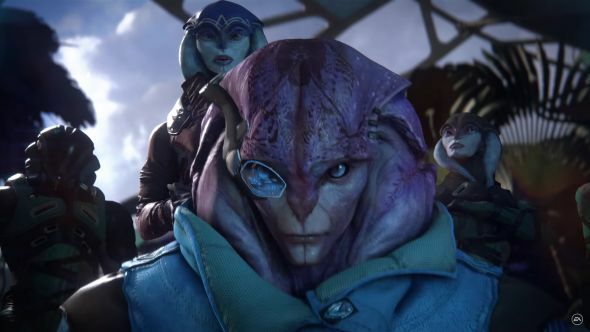 And navigating the fragmented remains of the Andromeda Initiative won’t be your only diplomatic challenge: the Angara are a native species who, unlike the Kett, at least seem willing to talk. Again, our best look at them came in the New Earth trailer, where – judging from the guns they point at Scott Ryder – they give you a frosty reception. Perhaps they, and/or the Kett, have been given a reason to treat Milky Way species with suspicion since the rest of the Initiative arrived, and it’ll be up to you to smooth that over. The original trilogy featured lots of alliance-making to resist the Reapers; now it might be down to you to convince others you come in peace. 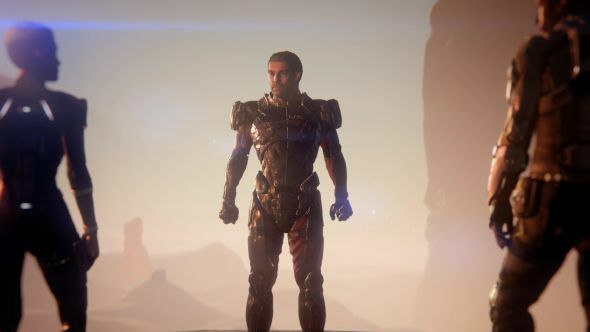 If all this sounds a bit choppy, that’s because that seems to be the approach BioWare are taking with Andromeda’s story. Previously, the huge threat of the Reapers meant it was “really hard to have a story about an individual, their struggles, their personal crises,”says Gamble. “For Andromeda we wanted to remove that a little bit so that we can tell stories of exploration, stories of a more casual nature… the story is about settling, the story is about survival, the story is about the locals”. So, when you finally show up to the party, you can expect a whole mess of different challenges to overcome. Settling new worlds, recruiting (and, ah, fraternising with) new squadmates, fighting the Kett, navigating the broken factions of the Andromeda Initiative, convincing the Angara that you’re not all bad – expect a ton of different stories to discover. And expect your choices to matter. It’s easy to see how your decisions – to align with one faction or another, for instance – will contort the narrative, while it’s been confirmed that they will affect your relationships with those around you. Some dialogue options will only appear because of your story choices, and characters will reference your earlier decisions. 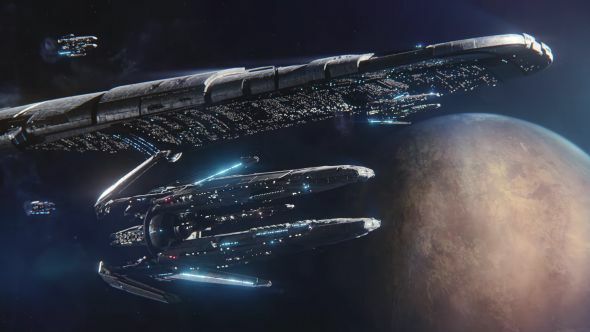 Of course, one of those stories has to come to the fore to drive the plot onward, and though we expect the Kett, Angara and Andromeda Initiative to all play a role in this, there’s one last piece of this puzzle about which BioWare are keeping very quiet: The Remnant. That same survey says you’ll be able to explore abandoned Remnant ruins to find powerful artefacts, but in removing them you’ll activate various defences – including robots – intent on preventing your escape. Much of this has since been corroborated; a4K tech trailer for the PS4 Pro showed Ryder exploring a “vault”, finding others on other worlds, and describing its inhabitants as “Remnant”. PC Gamer’s piece also mentions “puzzle-locked vaults”, and we solved one of three such locks on Kadara’s vault in our preview (after triggering security bots that resembled floating artificial squid when we failed on our first attempt). Is Cerberus behind the Andromeda Initiative? Cerberus, as fans of the original trilogy will know, are a human supremacist organisation led by the cunning and ambitious Illusive Man. 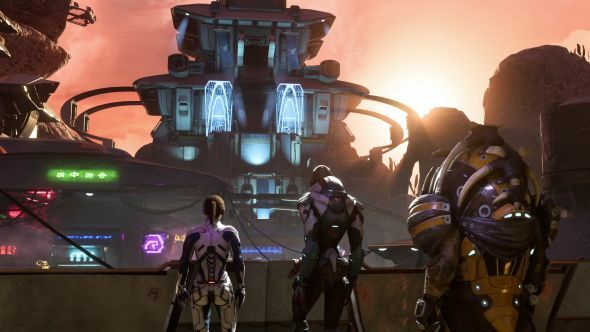 As more details of Mass Effect: Andromeda have trickled out, a theory has emerged that Cerberus have some kind of connection with the Andromeda Initiative. Here’s what we know. The Andromeda Initiative is a civilian project funded at least partially by “powerful benefactors”. It’s well-established in the original trilogy that the Illusive Man was an expert at hiding Cerberus’s activities – and its money – behind shell corporations. One or more of these unnamed benefactors could easily be fronts for Cerberus, and the heft they would then command could open all sorts of doors for their agents to infiltrate the Initiative. By itself that’s a bit thin, but there’s much more to say about Ryder. Credit to YouTuberMinius GCfor spotting the similarities between Miranda Lawson’s statement of Cerberus’s agenda in Mass Effect 2 – “the advancement of the human race” – and Ryder’s interest in artificial intelligence “as a means of human advancement” in thePathfinder team briefing. Not only is the phrasing comparable, but Cerberus’s interest in AI for the exact same agenda is clear in the original trilogy: they created EDI, the shackled AI that ran the Normandy SR2’s systems. Alec Ryder created SAM, the AI that will serve the human Pathfinder team. We also learn in that briefing that SAM will interface with each of the team via neural implants developed by a Dr Ellen Ryder. It’s fair to assume a connection to Alec there, the most obvious being a spousal one, but again, implant tech is something in which Cerberus take a strong interest. There are plenty of examples of Cerberus soldiers being enhanced with Reaper-derived implants, and two Mass Effect novels, Retribution and Infiltrator, deal extensively with Cerberus research into the same. Cerberus’s cybernetics expertise was also integral to their resurrection of Commander Shepard. Alliance interest in implant tech is tepid by comparison, partially due to ethical considerations that don’t trouble Cerberus (just listen to Kaidan Alenko discuss his experimental biotic implants). So Alec designed SAM, Ellen designed the implants that let you talk to SAM, and Cerberus showed a keen interest in both these fields. Let’s also remember that Alec Ryder fought in the First Contact War, which is so-named because it was humanity’s first encounter with alien life. The fact that it was a hostile meeting shaped human attitudes to the rest of the galaxy for many years, with the resulting xenophobia a key theme of the original trilogy. As a soldier in that war, it’s easy to suppose that Alec Ryder would’ve been among the many to develop that xenophobia. Finally, there’s Cora Harper. 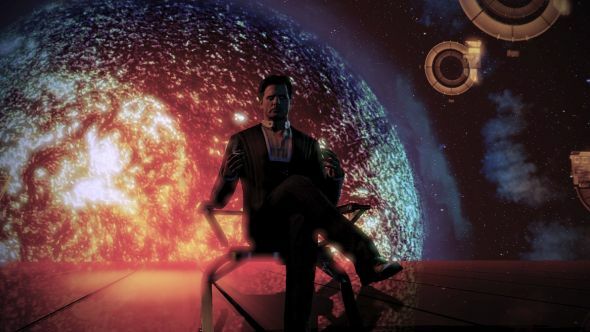 As revealed in the Mass Effect: Evolution comic, the real name of the Illusive Man is Jack Harper. Could she be a relation? By our count, that’s Ellen, Cora, Alec and, if Alec, then SAM, who might all have some kind of connection to Cerberus, with Jien Garson an unknown factor. Perhaps Garson’s pet project has been penetrated by Cerberus, perhaps she’s been working with them all along, or perhaps this theory is all nonsense. And on that note, you should know that BioWare have poured water on all this. Lead designer Ian Frazierdescribed as “low”the chance that Cerberus will appear, while producer Fabrice Condominas said “not that I know of”, when we asked him if anyone in the Andromeda Initiative had a connection to them. That’s all the info we’ve been able to glean so far about the major story beats of Mass Effect: Andromeda. We’ll update this post as and when new details emerge.